Contents: F. Craik, A. Ortony, Preface. Part I:Recollections. J.M. 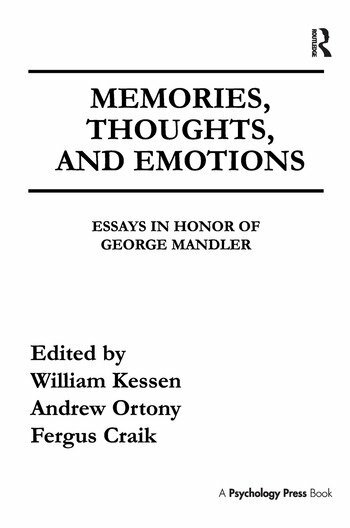 Mandler, W. Kessen, George. S.B. Sarason, Luck Was a Lady That Day. D.A. Norman, Questions and Answers. Part II:From Association to Structure. K. Patterson, Learning by Association: Two Tributes to George Mandler. A. Cleeremans, J.L. McClelland, Learning the Structure of Event Sequences. C.R. Gallistel, R. Gelman, Subitizing: The Preverbal Counting Process. H. Gleitman, Some Trends in the Study of Cognition. H. Gleitman, L. Gleitman, Language Use and Language Judgment. Part III:Memory. D. Broadbent, Recall, Recognition, and Implicit Knowledge. P. Graf, Implicit and Explicit Memory: An Old Model for New Findings. G.H. Bower, D.J. Bryant, On Relating the Organizational Theory of Memory to Levels of Processing. L.A. Cooper, Memory for Representations of Visual Objects. F.I.M. Craik, On the Specificity of Procedural Memory. J. Morton, Cognitive Pathologies of Memory: A Headed Records Analysis. Part IV:Consciousness. T. Shallice, The Revival of Consciousness in Cognitive Science. A.C. Graesser, S.E. Gordon, Question Answering and the Organization of World Knowledge. G.E. Hinton, The Unity of Consciousness: A Connectionist Account. D.E. Rumelhart, Understanding Understanding. A. Karmiloff-Smith, What Every Cognitive Psychologist Should Know About the Mind of a Child. Part V:Emotion. N.L. Stein, L.J. Levine, Making Sense Out of Emotion: The Representation and Use of Goal-Structured Knowledge. E. Berscheid, The Emotion-in-Relationships Model: Reflections and Update. A. Ortony, Value and Emotion. "As with other festschrifts that have recently been published in cognitive science...Memories, Thoughts and Emotions makes multiple contributions to the field....We gain a greater understanding of the progressive impact Mandler has had on the field of cognitive science and why his ideas will continue to guide research in the future."